Kundalini yoga uses poses of relaxation as consciousness-building activities. Kundalini yoga is a yoga of awareness aimed at awakening the coiled serpent at the base of your spine and channeling this energy up your body through each of your seven chakras. "Yoga Journal" calls this style of yoga "an uplifting blend of spiritual and physical practices." A Kundalini practice incorporates elements you'll find in a standard yoga practice, like breath work and poses, but adds a meditative element and the chanting of mantras. Your energy awakens through the combination of these four elements. Kundalini yoga practitioners believe that awakening the energy dormant at the base of your spine lets you access the life force of the universe. Practitioners can channel this energy to seven chakras located in various parts of the body: in the base of the spine, the lower abdomen, the solar plexus or upper abdomen, the center of the chest just above the heart, the throat, the third eye and the very top of the head. Each chakra is linked to an emotional vulnerability, such as self-worth, self-confidence, love, joy, inner peace and self-esteem. The practice of Kundalini yoga itself -- which combines pranayama, or breath work; kriya, or poses; meditation; and mantras chanted during the practice -- can awaken this coiled serpent energy and channel it to the chakras. Most styles of yoga emphasize the connection between your breath, your mind and the way your body moves, and Kundalini yoga is no different. In this practice, you’re encouraged to breathe in and out as slowly as you can, which will help you increase the control you have over your mind. This style of breathing is called pranayama. To regulate your breathing during a Kundalini practice, you can take long deep breaths, which can help quiet your mind and calm your heart. You can also alternate breathing in and out through each nostril. Deep exhalations through the mouth, called Lion’s Breath or Breath of Fire, can help energize and stimulate your body. Kundalini practitioners use meditative processes to quiet their minds and increase their overall awareness of their bodies. 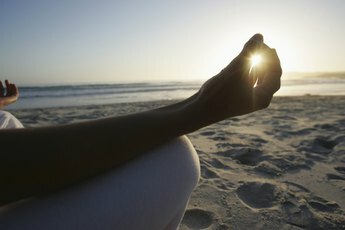 They link meditative practice to a specific end result, such as deep sleep, increased energy, dealing with change or alleviating stress. There is even a meditation to heal a broken heart. 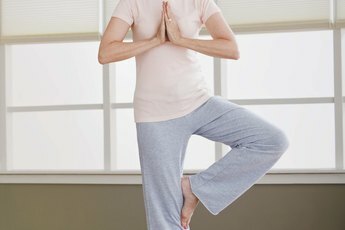 To stimulate their chakras, Kundalini yogis sit with their legs crossed and back straight, place the fingers of their left hand on their third eye and extend their right arm out with their palm facing up, close their eyes and remain in this position while slowly breathing in and out for 18 minutes. During a Kundalini practice, you will chant mantras, repeating a single sentence several and sometimes dozens of times. Kundalini practitioners use mantras to raise their consciousness and attract peace, prosperity and connection. Mantras you may encounter in a Kundalini practice include “I bow to the creative wisdom, I bow to the divine teacher within,” “Truth is my identity,” “Wise, wise is the one who serves infinity” and “Happy am I, healthy am I, holy am I.” Although some mantras aren't in English, you don’t need to understand what you’re chanting to benefit from the chant, says 3HO. What Are the Seven Types of Breathing Exercises With Ramdev Yoga?